I’d have to be blind to not notice that frozen yogurt has come back to the Philippines. Yes, “come back.” Progenitors of this dessert include TCBY which had a celebrated but much abbreviated stint at Megamall in the early 90s, New Zealand Naturals (which I miss terribly), as well as that Japanese (or was it Korean?) frozen yogurt stand in Landmark. And of course BTIC (Better Than Ice Cream) has been around since the same time but no one really seems to be moved by frozen yogurt that isn’t soft serve. Whether you call it fro-yo, frozurt, or frozen yogurt, it’s the next local food trend that’s fast gaining critical mass and will explode in early ’09. As with all things fashionable, there are those who will ride the wave and frozen yogurt will soon be coming out of everyone’s ears. But only the strong, or in this case, only the truly delicious and those who offer fresh (as opposed to frozen) toppings will survive. Though frozen yogurt has been in existence since the 1970s, there’s never been a better time for it than now. In an era where health is forefront and foremost on everyone’s mind, frozen yogurt seems to be the answer to the never-ending search for a dessert that miraculously combines flavor and satisfaction. Similar to ice cream, but – hallelujah! – lower in fat, and made with yogurt, it may actually get Filipinos hooked on yogurt, both the frozen and non-frozen kind. Frozen yogurt is sweet or sour or both, and may or may not (gasp!) contain the live bacteria cultures that makes it, erm, yogurt. Various flavors abound, and though Manila has frozen yogurt purveyors that sell in tubs, soft serve rules. Commercial frozen yogurt may include gelatin, a natural sweetener or sugar substitute, and additional flavors and colors. Pinkberry and Red Mango are considered the proponents of the frozen yogurt movement and it’s from them that a thousand copycats originate, some right here on our home turf. Ultimately, it’s about the taste of the yogurt. It bills itself as “so good that you can’t get it off your head,” although why I’d want to put my dessert atop my head is beyond me; my food goes into my mouth and nowhere else. White Hat’s claim that it serves Italian frozen yogurt is a bit puzzling since Italy isn’t really known for its yogurt, frozen or otherwise. I like the store’s compact layout awash in sky blue. Indeed, as I’m about to find out, all these frozen yogurt stores are meccas to pastel shades and swirls. There’s also that pleasantly chilly, dairy smell in the air here and the toppings wink up at me from their shining containers: fresh fruit, tiny mochi balls, and on the day I’m here, cheesecake bits and chocolate sandwich cookies. 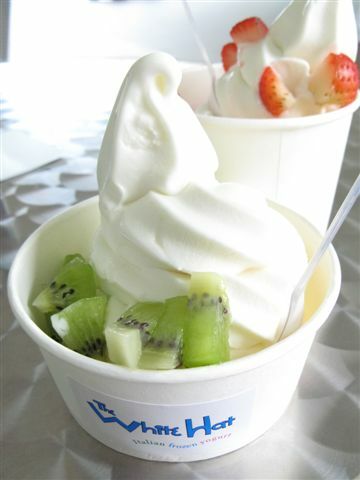 White Hat’s frozen yogurt is sweeter than all the other yogurts I try ”“ in fact, it’s the sweetness that I taste first. It’s instantly followed by a rounded tang and almost painful creaminess, with a bit of fluff at the end before it melts on my tongue. It’s very, very good ”“ so good that it drives some people I know to distraction. I have friends who come here at least twice a week, and those who order two at a time, varying only their toppings. Oh, and if you take photos of your visit here, one of the staff will ask to take your photo. Don’t know why that is. Its because our yogurt comes direct from Italy.Â Yes mam, we don’t use cheap yogurt and sell it at premium prices.Â Of course, the Italian yogurt base is the most expensive in the world, definitely, more expensive than Korean made or even US made (since we pay in euros). Why we call ourselves “AUTHENTIC” Italian is because our recipe was developed by an expert Italian gelatero who was able, through many trial and errors and taste tests, to come up with a recipe that is suited to the Filipino taste buds.Â Maybe this is why you commented on the sweetness.Â But i assure you, we don’t add any sugar or sweeteners at all.Â Its just that our formula is exclusive to us and made-to-suit our market. Oh, and we also upload the pics we take of customers into our website … sort of a marketing gimmick you know.Â But people love it! Its logo and font will remind some people of Pinkberry, but aesthetics aside, it delivers on its product which is imported from the States. The usual canned fillings are here and when I ask for fresh fruit, the attendant looks at the counter behind her where a supermarket bag is spilling over with fruit still in their packaging. “Mayroong kiwi, banana, at mango,” she replies. The small size here is very small, so small that I gawk, prompting the same attendant to say that it’s “mas sulit” if I get the larger size but I decline. 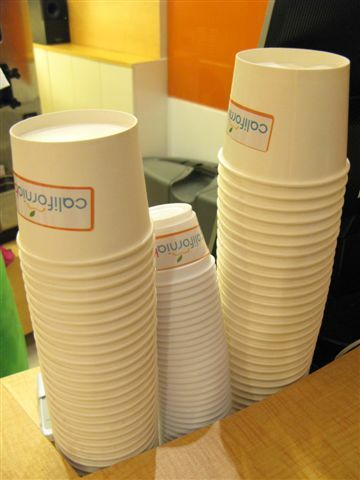 the different cup sizes at Californiaberry. See how small the small is? My first taste is refreshing and properly tangy. Light and less dense too, it’s flavorful and for some reason, makes me start thinking about how good it’d be in a smoothie. Tucked away and hidden in a small space in the Silver City parking lot, Californiaberry just needs to do something to increase its visibility. At the Silver City Mall with a Starbucks at the corner of the building. Park at the covered parking (of the mall) and you’ll see CALIFORNIA BERRY right at the entrance. For inquiries, contact Kyle You at: kyleyou@californiaberry.net. If you can’t be Red Mango, why not be Green Mango? Other flavors are offered here in lieu of the plain yogurt: vanilla, ube, green tea, and chocolate. But variety may not always be better. The vanilla, my first order, reeks of cheap vanilla and tastes like it too. It’s a good thing I’m eating with my back towards the attendant lest she see my grimace. I’ve always been bad at hiding my emotions. Not wanting to give up, I ask the girl behind the counter what the second most popular flavor is. “Chocolate,” she replies. The purist in me is screaming, and I can’t imagine ube yogurt (!) so I go with my gut and go for the green tea. It’s decent enough with that certain (slight) bitterness characteristic of green tea and enough tang to remind me that I’m eating frozen yogurt. It’s not as creamy as the others I try; I think of it as yogurt for those who don’t like yogurt. I like the vibe of this place ”“ it reminds me of a new age ice cream bar and the bar seats are groovy. I pay a lot more for my frozen yogurt here but that’s because it’s in a glass receptacle instead of a paper cup, and it’s a hefty serving. Though I prefer White Hat, I could live on the Ice Cream Bar’s frozen yogurt: smooth and mercilessly creamy and consciously tart, it’s refreshing and still sweet enough to make me feel that I’m having dessert and not a low-fat alternative. I only wish that they were more consistent in having fresh fruit and strawberries. When they have it, the granola topping is awesome, but most of the time I end up having to settle for the canned stuff. My sisters are frozen yogurt addicts. For them, it’s like crack and when they want their fix, we make a day trip to Pampanga and head for Cold Spoon. Run by Koreans and managed by Filipinos, it’s an arctic oasis in the middle of a brown wasteland. Inside, it’s chilly and white, the perfect backdrop to consume frozen victuals with a cold (plastic) spoon. 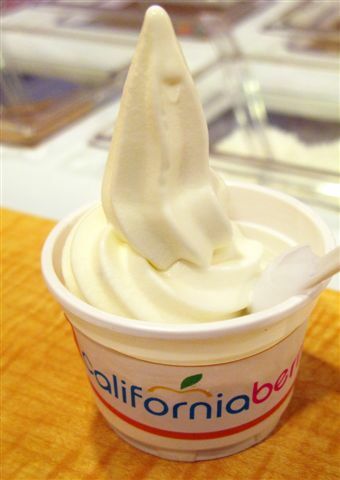 Most of these frozen yogurt stores use a dehydrated yogurt formula that is rehydrated and churned in the store. Proof of this are the boxes of frozen yogurt mix out back with Korean characters that undoubtedly spell out such. No matter, for the yogurt at Cold Spoon never disappoints me and my sisters. Lightly sweet, it tastes almost all natural with enough sourness to make cheeks pucker. I appreciate the flavors that linger and the clean finish. Only canned toppings are offered here, too many of which make the frozen yogurt taste like a bastardized, saccharine version of what it’s meant to be. Stay away from them and enjoy the yogurt as is. I only wish there was a Cold Spoon in Manila. 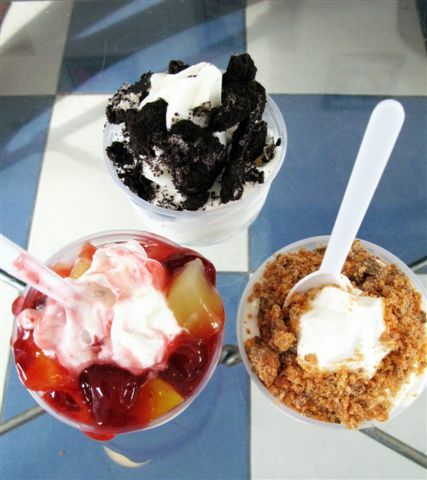 Cold Spoon is located along the Fil-Am Highway that runs near the Clark Freeport Zone, Pampanga. The possibility of tasty food with health benefits often fuels unstoppable food trends, which frozen yogurt undeniably is. Unfortunately, those who rush to be the first on the scene slip and slide along the way, peso signs glinting in their eyes. R&D (research and development) suffers and profit often overrides quality. 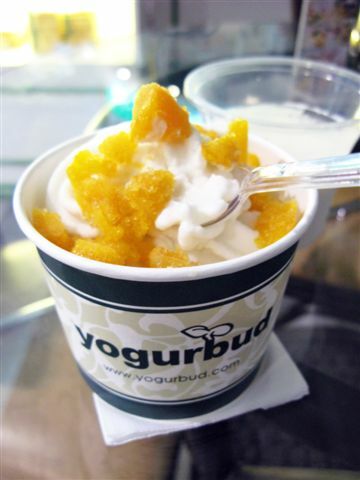 Along with Yoh-gurt Froz which isn’t included in this round-up, Yogurbud was one of the first on the frozen yogurt scene. It should be lauded for incorporating yogurt into meals by offering yogurt puddings, fresh salads with yogurt, and yogurt dips to eat with bread, a sort of faux fondue, if you will. Of course their star product is their frozen yogurt which is ghastly. Icy and somewhat nubby in texture, it’s almost too sour to qualify as dessert. To add salt on the proverbial wound, they top their yogurt with frozen fruit! It’s a mortal sin however you churn it. In a tropical country such as ours, there’s absolutely no excuse to be doling out frozen mango (or fruit, for that matter!) on top of food. I also try their fresh yogurt, thinking that it might be better. No go. It tastes like yogurt but the texture is all wrong ”“ like eating cold and sour egg whites. Eeew! But I end up finishing the damn thing, thinking that maybe ”“ miraculously! ”“ it would taste better. This is one Yogurbud that’s Yogurbad. One would think with the aspirations of Yogurbud (check out their website; it’s clear they want to be the Pinkberry of the Philippines) they would GET A CLUE about their frozen fruit which virtually everyone who has reviewed them has called them on. Oh well, I guess I should admire them for sticking to their guns. Maybe frozen fruit is actually awesome and we just don’t know it yet. Yogurbud gives proof to the saying that it’s better to be best than to be first. Ooh. How timing naman. We have tried only the frozen yogurt at the Salcedo Market, and it tasted just like ice cream! Thanks for the heads up on the other brands. It’s a big ouch to spend that much on a small cup when they are not good. Nice to see that there are other yogurt places out there. Maybe i’ll give ice cream bar another chance when they have granola topping. First time there was a bit of a disappointment as the fruits weren’t exactly of good quality and as much as good yogurt is good, the toppings really have a say when the price is that much. I found Yogurbud way too sour the first time that I tried it too. But I strangely just got addicted to it’s sourness! I actually like it. Thanks for the other Manila fro-yo tips. Didn’t know so many have sprouted up already! Found another fro-yo shop in Pampanga which you can try if you’re in the area : Yogurt Have. I liked their fro-yo too. I love the sweet/tangy combination of white hat yogurt. Im not a big fan of yogurt or any sour foods but the sweetness in white hat’s yogurts is just enough to keep me wanting for more. I like the frozen yogurt at btic with granola and bananas. absolutely yummy. i like fro-yo along tomas morato. they flavor the yogurt by blending (crushing? mixing?) 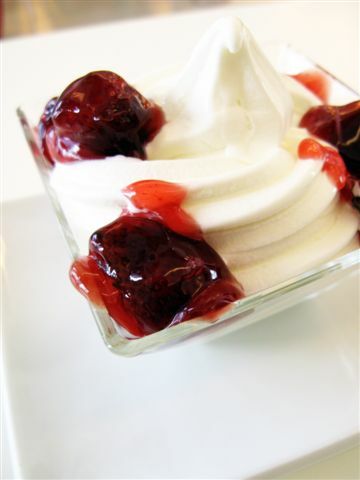 it in with the plain yogurt in a way that it comes out uniformly flavored – not swirled. strawberry banana yum! i knew something was wrong with yogurbud…. had to convince my brother to buy one since we’re really not fond of yogurt and once we tasted it we wanted to ask for a refund! I prefer BTIC. Good memories eating my mint with choc chips in a wafer cone in Glorietta. I also like their pistachio (I nearly said ice cream! See what I mean?) frozurt. Mmm… BTIC. Haha! Excellent play with words Lori! enjoyed reading your Yoghurt rating blog Lori! 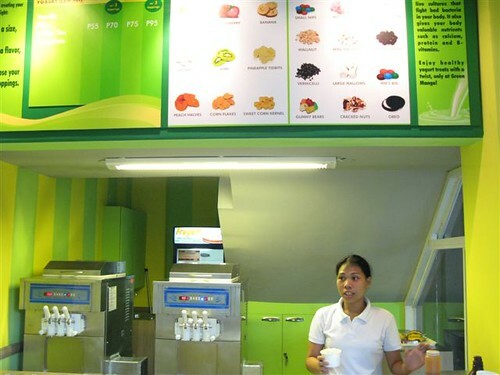 there’s also yogurt fruz along tomas morato. whereas they have all these flavors, i tend to favor their berry mix. quite good. just the right sweetness and a good balance of tart fruit. they use frozen berries but most other fruits are fresh. You mentioned New Zealand Natural and got me craving for it! I went to KL for vacation and I just had to eat 3 scoop cones for all the days I was there.. I hope they come to the Philippines.. I posted that in Our Awesome Planet before, and I totally agree with the frozen mango. Naka plastic pa huh! I make my own frozen yogurt. I buy 1 big tub of plain Nestle yogurt from Unimart. Put some in a cup. I pour orange blossom honey on top. 1 tub at P110 is 3 servings for me. My 3 yr old daughter loves it too! That way, I’m sure no more additives on my frozen yogurt. I love New Zealand Natural too! I ate when I was in Singapore last June. 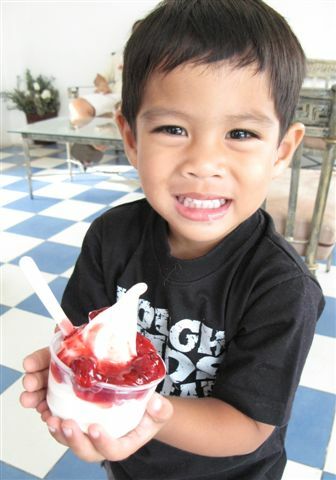 In Oceanside, CA, there is a growing trend for yogurt places as well. It’s the newest hangout place! We ate at Yogurt World and it was really jampacked! Different flavors of yogurt from banana, yam, strawberries & cream and even coconut! and you can choose from loads of toppings! I loved it!! I hope there will be one like it in the Manila. can’t wait to go home and taste all these! my favorite ice cream (i don’t even consider it different from the normal ice cream) is BTIC’s dark chocolate almond fudge. I went to try Californiaberry and it was very good, I love it. I suggest the medium with three toppings over the small size because its only 20 pesos more and the servings is big. I’ve been trying out all the frozen yogurt places here trying to find something that satisfied me the way Red Mango did when I tried it in Thailand and I still haven’t quite found it, although some of the places weren’t bad at all! Still, it would be cool if the actual “proponents” as you said would come to Manila. Lucky for me then, and for everyone out there who’s been craving for it, I heard from a friend that someone’s already gotten the franchise from Korea and it’s coming to the Philippines very soon! I hope they open really soon so I can finally get my Red Mango fix again! I had the misfortune to try Yogurbud a few weeks back; was pregnant and craving something cold but didn’t wan the calorie-count of ice cream (kahit na Sebastian’s was right there!) so I opted to go healthy and went for the yogurt. Boy, did I regret it. Yes, I read the comments about people who liked it, but it’s definitely not MY thing. On your recommendation, hubby and I tried Californiaberry last night. I had the kiwi-strawberrymango combination in a medium cup, and woohoo! That lifted me out of post-aprtum distress. Thanks for another wonderful discovery! It’s 3AM and you got me drooling for frozen yoghurt! 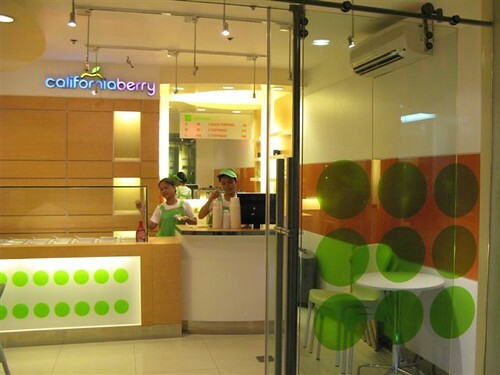 CaliforniaBerry is quite close to Pinkberry. taste and texture is good. toppings, they have alot to choose from. Service is good too. I tried Ice Cream Bar’s Frozen yogurt yesterday and I absolutely loved it! And the owner is so gracious! She gave my friend and I a dollop of yogurt to try, with toppings pa! We ordered Cornflakes with cranberry puree, YUMMY! The yogurt is so smooth and doesn’t have that artificial flavor at all. Can’t wait for my next visit! a few days after i read this post, i found a frozen yoghurt place that just opened up near where I live (Pleasant Hill, CA, about 40minutes east of SFO). 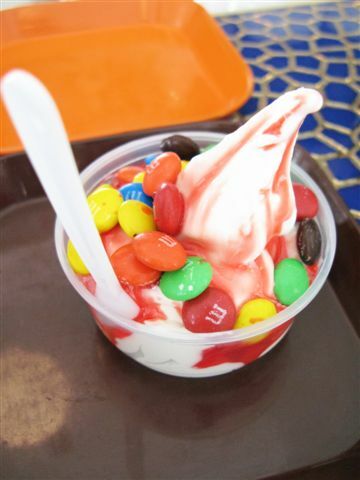 You basically just get a cup, go to the self serve, soft serve machine to get the flavor/s of yoghurt you want, put some toppings (nuts, fresh fruits, candies) and they weigh it at the counter. Hi everyone, i tried Califoniaberry a few weeks ago, definitely better than YogurBAD, but not that great i think. can’t agree to the 4/5 rating. at most 3/5 for me, there was a bitter aftertaste that made me think that its artificial or reconstituted yogurt. and i like their website although why they put fresh raspberry pics there and then NOT have it in their shop is beyond me, maybe they simply copied those pics from pinkberry like they blatantly copied everything else..
It’s funny how frozen yogurt places can’t come up with unique names. There’s Red Mango and Pinkberry here in the US. Will definitely try Californiaberry today after work. My friend likes it very much and recommends me to try it. What’s with all the names. I think there’s also a Pink Citrus and a White Mango somewhere… I’m guessing there’s going to be a Pink Mango, Berry Pink and Red Berry pretty soon, if there aren’t already. It’ll be interesting to see what happens when the real Pinkberry and Red Mango open here. Will the people still think of them as the original? Oh… and I completely agree with your review of Yogurbad, I mean Yogurbud. It’s just terrible tasting. Two of us couldn’t even finish a single order. Cold Spoon has been the best so far though. Tried Yogurbud to see what all the fuss is about… all i can say is… Very Disappointing. Taste like medicine. Fruits aren’t fresh at all. Toppings are not shown upfront nicely. Poor presentation. Didn’t finish my single serving also. Terrible. C’ Italian Dining is less than 15minutes away…. Amazing article! I should have read this before yesterday, deciding to be addicted to frozen yogurt. Now I vow to try everything you mentioned. I’ve been going on a Frozen Yogurt Craze…. My absolute favorite is Cold Spoon, but given the high gas prices, I don’t get to make a trip to Pampanga as often as I would like to. So I have to satisfy myself with what is available in manila. I went to California Berry in Silver City. I got the medium size for P85. I like my yogurt plain, so no toppings for me. In fact, the fresh fruit in the display looked very limp and unappealing…why do you need to slice fruit so thinly? I have to say that their vanilla yogurt was very good. But I was very disappointed in the size of the medium. The serving in the medium cup is soo small, it’s like the cup is bigger than the serving that’s meant to fit there. back here in vancouver, we have yogen fruz – which, to me, is already very delicious! they use the machine that blends fresh fruits and yogurt bars together to give you that thick, fruity heaven. come to think of it, it reminds me of my childhood… i remember eating frozen yogurt just like this in shangri-la plaza mall about 10 years ago! anyway, keep a lookout for red mango in manila! 🙂 my friends are franchising it. Did your friends ever actually get the Franchise for The Red Mango shop in Manila? red mango may be the first but it’s not the best. I’ve tried a few stores in LA and it is not what I expected it to be. The sweetness of their yogurt taste like a sugar substitute (like equal) and also doesn’t have enough tangy taste to it. It doesn’t have much yogurt taste to it either. No wonder why the other brands beat the hell out of red mango. Once the consumers know how to differentiate how good a yogurt can taste, red mango will fade away really quick. Red mango will open soon in Trinoma!!! Wooohoooo…. Nothing still comes upto par with Pinkberry or RedMango. Definitely nothing close to the yogurt of Bloomingdale’s 40 Carrots!! The Best Ever! I tried I Love Berries from the bazaar and its just too sweet and has a very very slight tang to it. It tastes more like ice cream. And their mochi taste like tikoy. The froyo from the Ice Cream Bar is ok. Yogurbud is an insult to the whole froyo phenomenon! I just heard of Californiaberry here in this post. I’ll give it a try tmrw…Funny how the store copied the almost exact interior of Pinkberry. Btw, does anyone know where to get Fage Greek Yogurt here in Manila? I think greek yogurt is still the best, and not to mention the healthiest way to enjoy yogurt. fage yogurt is sold in all SR stores in Manila. They have strawberry, blueberry, honey, peach and plain! So yummy!!!!! Nice one! Agree with you that Yogurbud is Yogurbad! I had a really hard time finishing my order (plain yogurt -just to taste its base). 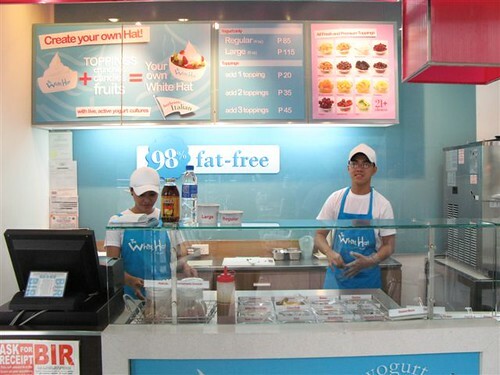 There is a Frozen Yogurt store at T. Morato fronting Office Warehouse, it is called Yohgurt Froz. I tried their Classic Froyo & it was very good! Taste-wise their yogurt is very good, the best i’ve tasted locally. Not too milky, i dont like to drink milk so i eat yogurt instead. Recommended. hi lori! have you tried DOLCE gelato at mall of asia? it’s the best gelato i’ve tried in manila. and they have so many flavors! the ferrero rocher is the best! and their gelato is half the fat of regular ice cream. My son, hubby and I, after watching an IMAX flick, wanted to indulge ourselves in something sweet, so we started walking towards Krispy Kreme. We noticed this cute gelato stall right in front of Bo’s Coffee. So we decided to stop by to check it out. The texture was so creamy that it reminded me the gelato I had in Rome and the best part is they let you combine different flavors with no extra charge. I definitely recommend Dolce Gelato, it is a must have when you are in MOA. i actually like yogurbud. got mine in megamall. the mangoes they used were fresh and sweet. and the bananas were cut right before me. plus! free bread! maybe you just got a bad batch? well, that’s just me. i also adore lulubelles. always go for large with granola,mangoes, banana and strawberry. 😀 the store is so nice and pink and girly. love it! Wow, you must enjoyed the rounds of frozen yogurt places. 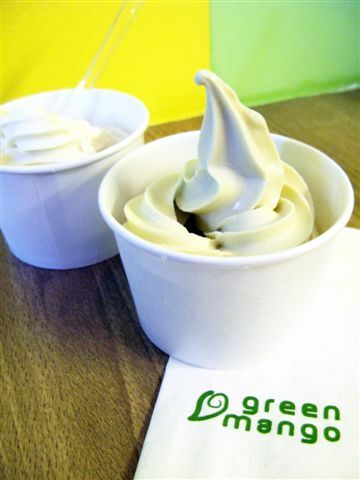 I laughed at the name of Green Mango, a spin-off of the popular Red Mango in the US. But they have their first store at Trinoma and tried it, it’s love! I also tried The White Hat and I also like it, they also have a variety of toppings you can choose. hi guys, its good i found this website. u know what? when i went to US there is a lot of frozen yogurt especially pinkberry and when i went to korea they have red mango, when i came here i looked for the frozen yogurt stores, i tried almost all, california berry, white hat, fro yo, i love berries, red mango, cold spoon in clark and so on, coz i really love frozen yogurt but it really saddens me coz i cannot find the real frozen yogurt like what ive tasted in US and KOrea, but finally before heading Robinsons place i saw bellagio square and there is WHITE Berry FRozen yogurt.. it is really amazing they have the realy yogurt.. not so sweet not so sour.. but PERFECT Frozen yogurt.. please try it.. for sure u will love it.. i always drop by there everyday to enjoy their plain forzen yogurt with kiwi and clusters on top.. try it too..
Have you tried Yoh-gurt Froz? Yes, I have. I’m not a fan. Wow, looks like I need to do a new frozen yogurt post. So many new ones have opened. How about Red Mango? I was surprised it wasn’t inlcuded in this round up. What are your top5 best and worst FroYo? Haha that would be interesting. Yes, I have, and the one in Magallanes also. It doesn’t taste so much like frozen yogurt as it does ice cream. I like the Cake batter flavor. I like yogurbud coz it’s the original taste of yogurt — not so sweet but tangy but lacks creaminess. White hat is simply the best. Red mango is the worst, same with Golden spoon.